Being accepted into Web Development Immersive Bootcamp at HackerYou is exciting. Every three months we hand select about 40 applicants to join us for the upcoming cohort. Whether you’ve already applied for the next Bootcamp, are considering Bootcamp as an option, or are at the very beginning of your coding journey, knowing what to expect from Bootcamp can help you prepare and better understand the process. Here’s what you can expect an average day in the life of a Bootcamp student to look like. On most days in the Bootcamp we’ll host a kickoff - a fun activity or video to get the day started that helps everyone loosen up and get to know each other better. Some HackerYou classics are challenges like tower building, games like Heads Up, and videos featuring Shia Labeouf. 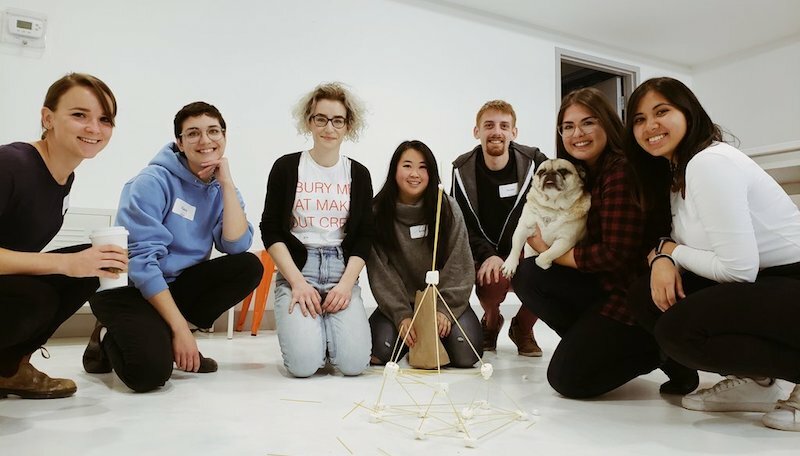 Our community is something we’re really proud of, so we like to start our days with fun tasks to help everyone feel more comfortable and at home at HackerYou. Cohort 20 Students after the tower building kickoff. Every day at HackerYou we take a morning and an afternoon coffee break for about twenty minutes. Morning coffee falls around 11:30, whenever the lessons have a natural break, but afternoon coffee is at exactly 3:34pm. It’s a HackerYou ritual, the origins of which have gone down in history, but it’s something we abide by every day. Students and staff alike take a break to get a drink, go for a walk, or of course, to get a coffee. Students in Cohort 20 even used their afternoon coffee time for stretch club - led by one of the students (who was also a yoga teacher). Each cohort forms their own rituals, but taking some sort of short break from work is something we don’t only encourage - but demand, as it’s important for mental well being and building a healthy work-life balance. Bootcamp instructor Asaf Gerchak has even been known to stand on a chair and bang pots together until students stop coding. Cohort 20 students during daily stretch club. After morning coffee time, students usually head back to the classroom to continue lessons, then we break for lunch at 1 o’clock. There are lots of great restaurants nearby to pick up food from, and we also have a kitchen for students who want to bring their lunch from home. For an hour the entire cohort and staff gather to eat in our community space, and are encouraged not to code or open their computers for anything. 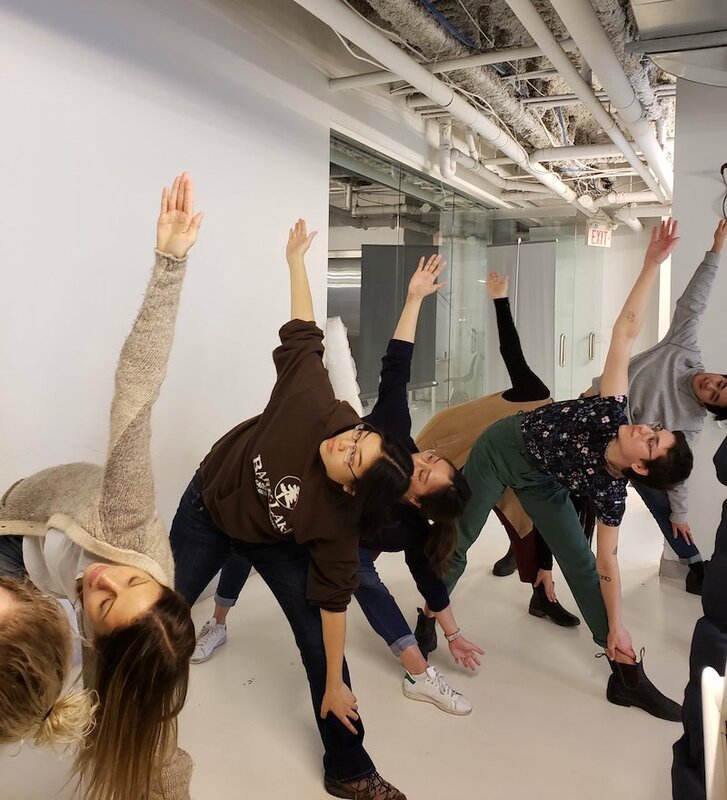 Again, having a healthy balance is something we feel is very important at HackerYou, especially when we’re teaching our students to build a workflow that will last throughout their coding careers. 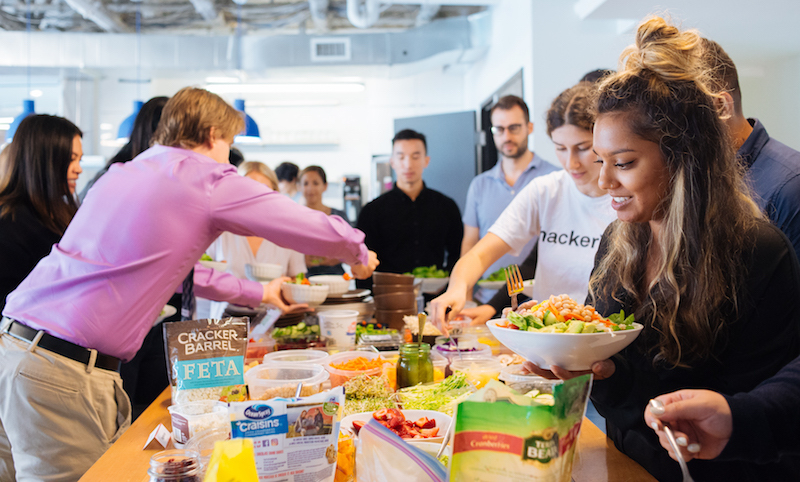 Salad club is something that HackerYou is famous for, and it happens every Wednesday of Bootcamp. Students are asked to bring in two salad ingredients which are added to a buffet-style salad table. At 1 o'clock everyone gathers together to build their own salad, eat, and chat in our community space (proving you really can make friends with salad). Since Bootcamp can be a busy and stressful nine weeks for students, we like to give them this weekly ritual to have some relaxing time to look forward to, and to ensure they’re all eating at least a few vegetables! Cohort 19 students during weekly salad club. During project work time Bootcamp instructors are also available on Helpcue - an app that allows students to put themselves in line for help from anywhere in our 7000 square foot bootcamp space. Instructors then help students on a first-come, first-serve basis. This ensures that everyone has access to help, not just those sitting closest to the instructors or those most comfortable speaking up. Through HelpCue, instructors spend project work time working one-on-one with students, answering their questions and helping them work through tough coding problems on their projects. Bootcamp students are required to be at HackerYou from 10am-6pm, Monday to Friday, for the nine weeks of Bootcamp. Though these are the mandatory hours, many of our students choose to work here before class, in the evenings, and even on weekends. Each student receives a key fob so that they have 24/7 access to the building and can work here whenever they would like to. Our space is bright and open, offers lots of seating options so our students can spread out while they work, and has amenities like free wifi, a full kitchen, and even the occasional furry friend. We consider all of our students family, and most of them consider HackerYou a home away from home while they are in Bootcamp. Every week on the day when projects are due, students are also required to present their projects to their classmates and instructors. Each presentation is only 90 seconds long, and students are asked to talk about their project, something that they are proud of, and a challenge they faced. 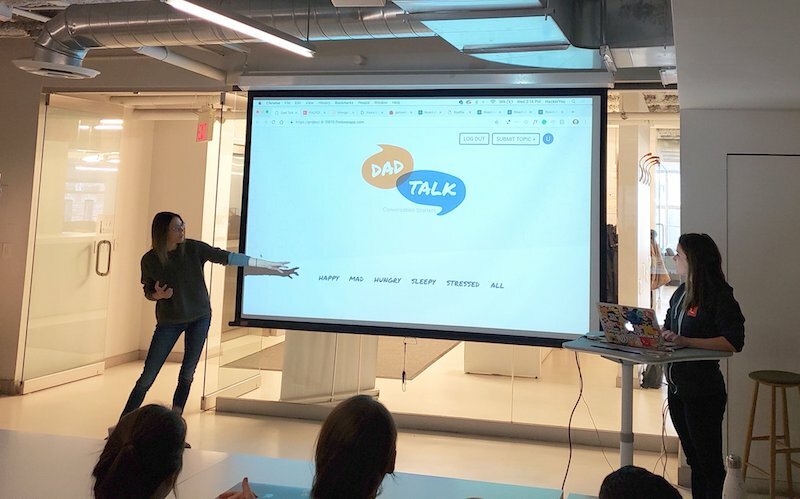 Project presentations are an important part of the HackerYou experience, not only to encourage students to be proud of the work they create, but also to help them improve their communication skills. Cohort 20 students presenting their final project. The first Show and Tell of Cohort 20. Throughout their time in Bootcamp, there are also a few things that happen just once per cohort. 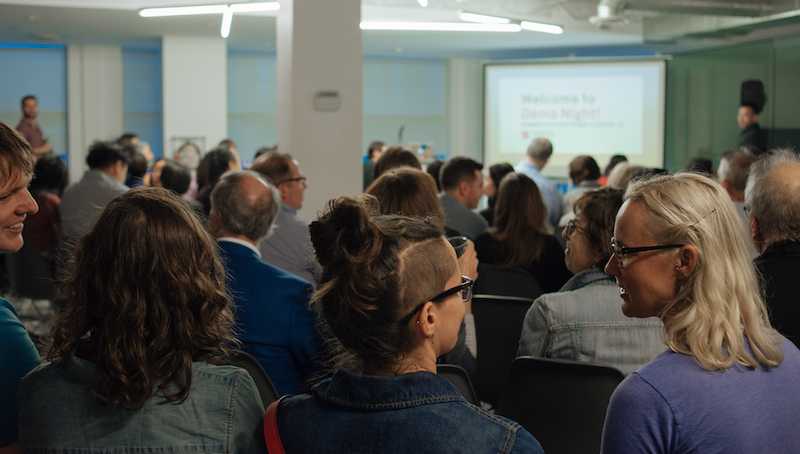 Demo Night happens in the last week of Bootcamp, and is a time when the community, family, and friends come together to celebrate the students’ work during Bootcamp. There is a presentation of some selected projects from the Bootcamp, and each student also has a station to showcase their work individually. Industry Day is another once-per-cohort event, that happens on the last day of Bootcamp. We invite professionals from the the Toronto tech industry into our space for a speed-networking event, and a chance to mingle. We prepare our students in the week leading up to Industry Day with mock interviews and practice speed rounds, and use the event as a chance for students to polish their interview skills and make some real industry connections. After the nine weeks of full-time Bootcamp are complete, the HackerYou experience isn’t over. The Monday after graduation, our students start the job seeking process. They receive support on how to write a great cover letter, create a resume, follow up with potential employers, and track the applications they have submitted. The HackerYou team is also available to provide ongoing support during the job seeking process and students are encouraged to use the space while they search. We also host regular meetings so the students can come together to talk about their successes and challenges during the job seeking process. Once the full-time Bootcamp ends, there is also Beyond Bootcamp - a bonus part time course that will be available for the first time to Cohort 21. It will run twice a week in the evenings for six weeks, and be a requirement for all job seeking graduates. Students will review the more complex concepts of Bootcamp to solidify their learning, and explore some new topics to expand their knowledge. This course is meant to provide structure and support for the students while job searching, and to help them find the next steps in their learning journey. After graduation, we also welcome our alumni to stay involved in the HackerYou community by becoming Bootcamp Buddies or Fishbowl Mentors. Bootcamp Buddies is a volunteer program that pairs each current bootcamp student with a bootcamp alumnus now working in the industry. This gives our students someone to provide support and answer questions throughout the entire process. Fishbowls are after-hours work sessions that focus on specific topics learned that week in bootcamp. Mentors attend to answer questions, guide exercises, and help current students solidify their grasp of the concepts learned throughout bootcamp. These programs ensure that our current bootcamp students receive the support and guidance they need, and that our alumni are able to stay connected to the community and continue their coding journey by helping others. If you want to get a deeper look into the daily workings of Bootcamp at HackerYou, you can follow us on Instagram or Twitter to see behind the scenes. Interested in learning more about Bootcamp and whether it might be a good path for you? Apply now or book a campus tour to come in and speak to a member of our admissions team. They can answer all your questions, show you the space, and help you plan out what your unique learning journey might be. Our Spring bootcamp deadline is February 15th, so apply now to get started!